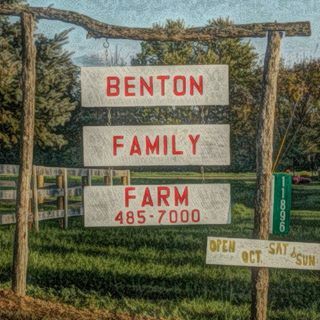 Northern Kentucky, KY Hulafrog | Benton Farms " Benton Family Farm"
Benton Farms " Benton Family Farm"
Farm Education is our Father's main goal, and to keep this farm around for generation after generation so all can know what a family farm is, was and will always be. It's his life... the land, the memories, hard times, dealing with Mother Nature, keeping his Family Hertiage alive long after he leaves this farm. Volunteers make this family farm operate and continue on, want to join up? We our officially by IRS a 501 3 C so with our committed mission to agricultural education we need support to continue on. Donations can be made to help send children on our field trips or camp! Many schools with our current economy has stopped school outings and limit to even one or none at some schools, so help us make the call and help get these children out onto a real farm. Serving the community for over 25 years now. Thank You for your support!